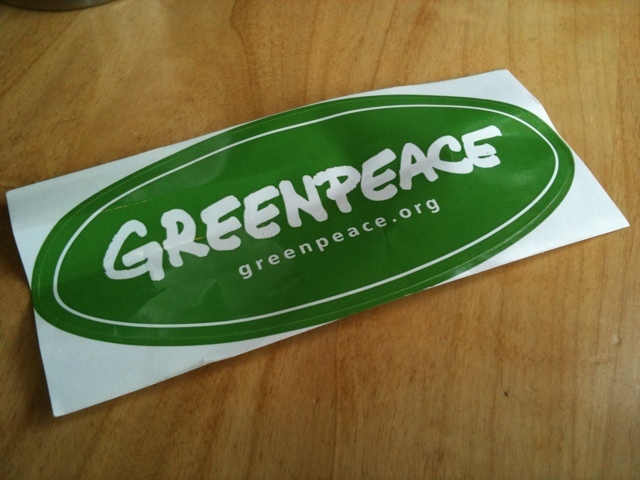 I just gave some money to Greenpeace. Why? Because my daughter will need to contend with all the environmental havoc that her father and her father’s father have wreaked on the earth. Because the young canvasser and her young mates receive so much rejection and someone from my generation should give them a bump. Even though she told some white lies to get my donation. Because they take direct action. And direct action will be needed to help shut this baby down. Because I could get away with only giving my name and so I won’t have to get any crap from them. Because they gave me a nice sticker. And it’s biodegradable. This entry was posted in Beings, Energy, Ravens and tagged father's day, Global warming, greenpeace by Andrew Lewis. Bookmark the permalink.